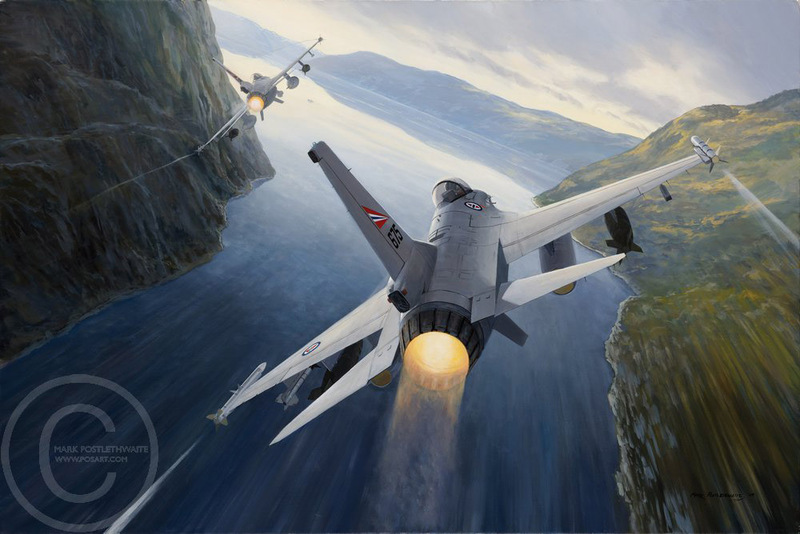 This painting, commissioned by the Norwegian Armed Forces depicts a pair of F-16s in their natural training environment. I have been visiting Norway for over 15 years and have been fortunate to fly throughout the country, observing the spectacular landscape and light from a pilot's perspective. The fjords are especially inspiring for an artist and I was very keen to include one in this painting. Keen eyes will spot the little man in a fishing boat up ahead, his reaction to his unexpected visitors will depend upon whether he's an aviation enthusiast or not!